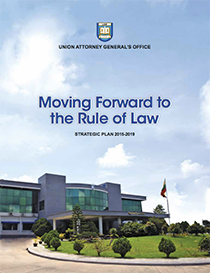 The Myanmar Union Attorney General’s Office published its first five year strategic plan in January 2016, available in English and Myanmar language. It focuses on four main areas: 1) to protect the legal rights of individuals and the national interest; 2) to strengthen the performance of the Union Attorney General’s Office; 3) to inspire public trust and confidence in the justice system; and 4) to take an active role in justice sector reform. 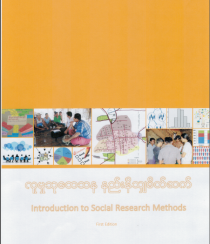 The first edition of Inya Institute’s manual provides a comprehensive introduction to social science research for Myanmar audiences. The resource includes sections quantitative and qualitative research; survey design and sampling techniques; focus group discussion and interviewing; and data analysis, among others. It is in English and Myanmar languages. 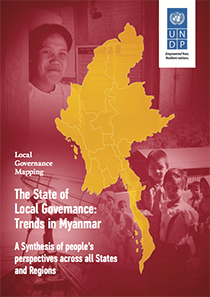 This July 2015 report by UNDP combines 5,400 citizen report card responses, community scorecard dialogues at the village level, and key informant interviews to map the state of local governance in Myanmar, as well as public opinion on a range of topics. UNDP published an in-depth report for each State/Region, available here. This August 2015 report collects responses from over 1,600 Myanmar people on economic conditions, social capital and trust, globalization, and a range of political and governance topics. The survey is conducted on a four year cycle, providing important snapshots of Myanmar public opinion through time.